Planning to shovel that snow yourself? We listed some steps to help you from getting injured. 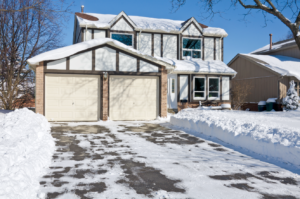 Prefer to hire a snow removal pro? Here are questions to ask first. To DIY or not to DIY — that’s the first question to answer about snow removal. Either way, we have you covered with tips from top-rated experts. Chilly weather restricts blood flow. Before shoveling, warm up by jogging in place and stretching. Also, avoid a big meal or smoking just before shoveling, as either will affect blood flow. It’s better to repetitively remove smaller quantities of snow than it is to move large totals at once. If snow is already deep, remove it in layers. As you shovel, keep your back straight, bend at the knees and use the strength in your hips and thighs to lift or push snow. Don’t twist. If you have health problems, ask someone healthier to do the job or hire a snow removal service. Many landscaping companies offer this in the offseason for a cheaper rate. Don’t delay your search; quality companies often have an extensive list of existing customers. How much snow will trigger service? This is a good idea particularly if you only want service when a big storm strikes. Also, tell the company if you have special needs that should give you plowing priority. Ours starts at 2 inches. We can salt and shovel on storms less than that but will not plow with our trucks. Are you covered? Confirm that the company is appropriately licensed for where you live and that it’s sufficiently insured and bonded. Don’t use ice picks on driveways or sidewalks. Use tall stakes to delineate driveway boundaries ahead of heavy snow. Be careful with de-icing products. For instance, sodium chloride, or rock salt, is typically the cheapest deicer, but doesn’t do well in temperatures below 25 degrees and can create a toxic chemical imbalance if it leaches into soil. Regular rock salt will cause pitting on concrete also and will break it up requiring replacement. Calcium chloride, which can be three times as costly as rock salt, does well in lower temperatures and is considered less harmful to vegetation. However, it can create a residue that may harm shoes, flooring and pet paws. Calcium magnesium acetate can cost 10 times more than rock salt, but won’t harm the environment and is less corrosive to concrete than salt. However, like rock salt, it doesn’t perform as well in lower temperatures.